Practically everyone knows the song, Bohemian Rhapsody, and the band, Queen, but how did they become so successful? 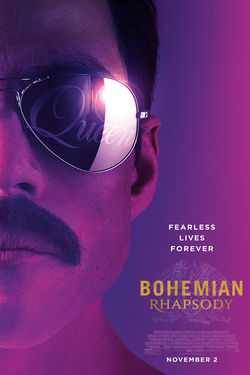 The movie detailing the life of Queen and lead singer, Freddie Mercury, just came out on November 2, 2018 and everyone is excited to see it. Some people have been criticizing the movie for not following the full story, even though it must fit in a small time frame to show on the big screen. Half way through production of the movie, the director, Bryan Singer, was fired and was replaced with Dexter Fletcher. The movie went from a joyful theme to a harrowing film about Mercury becoming a drug addict and losing his family. After Mercury decided to go solo, he yelled at his bandmates and ditched them for money. When Freddie realized he could not do music without his bandmates, he apologized and wanted to pick up where they left off. They went to one of the biggest music events ever, Live Aid, and performed for 100,000 people at Wembley in England. Reviewers thought that the movie didn’t follow the true story of the band Queen, and that it over dramatized Mercury’s life story. Some other reviewers believed that the movie was precise, and that it was a great way to show how one of the greatest musicians of all time became so known. The story of Queen and of Freddie Mercury is truly incredible. Freddie Mercury is one of the greatest singers of all time, and the story of his music and how he became so famous is unbelievable.